Ahead of Apple's annual shareholder meeting, Greenlight Capital presented its sales pitch to investors for Apple to offer preferred stock shares  or, as hedge fund manager David Einhorn referred to them, "iPrefs." With Apple's massive cash hoard now at $137 billion and growing, Einhorn and Greenlight hope to get shareholders behind their plan, which they believe will unlock value for investors. Einhorn believes Apple's iPref program could start small, and distribute one preferred stock share for each common share to existing investors. Under Einhorn's plan, Apple's so-called iPrefs would pay out a dividend of 50 cents per quarter, or $2 per year. Over time, he believes Apple could grow the program to offer a total of five iPrefs per share of common stock. 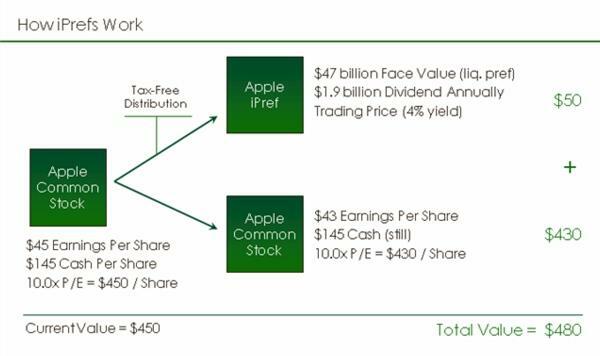 At five iPrefs per single common share, Apple's preferred stock would double the current dividend offered by Apple. Einhorn, in a conference call with investors and the media on Thursday, said he understands that Apple plans to be disciplined with its cash. He believes his iPref concept would make that promise to investors explicit. His hedge fund has been an investor in AAPL stock since 2010. Distributing iPrefs to existing shareholders would reduce the share price of the common stock. But Einhorn believes the combined value of common stock and iPrefs could be considerably greater than the company's current share price, unlocking value and bringing in new investors. In his calculations, iPrefs could unlock $61 per share more than the next best alternatives, which in his view would be a one-time share repurchase or a special dividend. Einhorn predicts that iPrefs distributed at a ratio of five shares per one share of common stock would pay out $250 to investors, while also lowering the current stock price from $450 to $350. But the total value of the iPrefs along with the new common stock price would be $600, or about $150 greater than its current value of around $450. 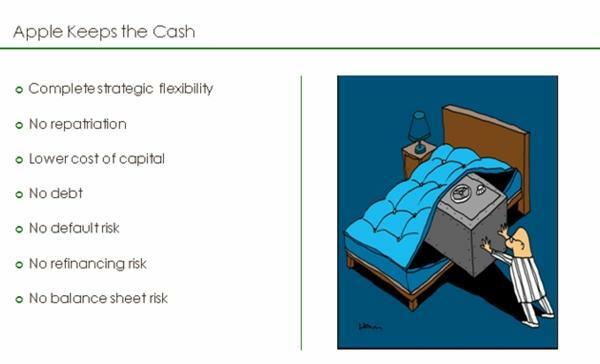 The Greenlight Capital proposal suggests that iPrefs would appeal to individual savers, bringing in new types of investors such as insurance companies, pension funds, and institutional fixed income funds. While Einhorn's ideal projections call for five iPrefs to eventually be distributed per one common share, he believes Apple should start slow with just one iPref per share. 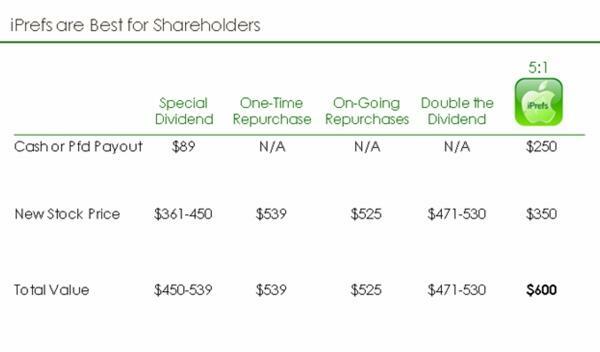 Those preferred shares would be given for free to existing shareholders, but iPrefs could be sold on the market and would have a value of about $50 each. By starting small, Apple would allow the market time to adjust and determine the fair open price for an iPref share. Starting at one iPref per share, Einhorn predicts that Apple's common stock price would drop from $450 to $430. But when the value of a $50 iPref is included, the total value to shareholders would be $480, or $30 more than the current common stock share price. Einhorn believes his iPref concept would allow Apple to keep the bulk of its cash hoard overseas without needing to repatriate it and pay a tax rate north of 30 percent. It also leaves Apple with the ability to do what it does best with its money while returning some value to investors, he said. "We don't know what Apple's plans are, but iPrefs don't interfere with Apple's using the existing cash hoard," Einhorn said Thursday. Greenlight's proposal was presented to Apple last year, but the concept was rejected by Chief Financial Officer Peter Oppenheimer, Einhorn said. But now in the last week, Apple Chief Executive Tim Cook has reportedly called Greenlight's plan "creative," and indicated his company will consider it. The hedge fund manager is also suing Apple over the company's so-called "Prop 2" proposal, which would revoke the ability of Apple's board members to issue preferred stock, instead putting that power into the hands of shareholders. Calling Apple a "leader in innovation," Einhorn said he believes the company could blaze a new trail by adopting his iPref plan, working with investors in an outside-the-box manner that consumers already associate with the company's products. "It's not complicated, it's merely unfamiliar," he said. "It's also simple and innovative."